Is DMT the chemical code that allows us to exit the Cosmic Simulation? If the cosmos is a simulation then does DMT provide us with a method to explore beyond the simulation? 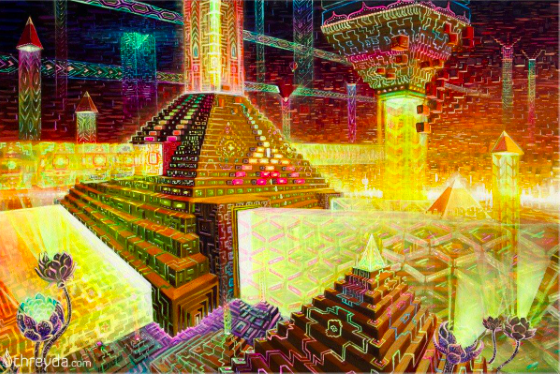 Is DMT the code that releases the human mind from the cosmic simulation? In recent years there has been growing debate over whether our universe is a computer generated construct or a cosmos composed of energy, matter and quantum fields. In 2008 the theoretical physicist S. James Gates presented a paper where he said he found something resembling error correction code in the mathematics of super symmetry and string theory. In 2003 Nick Bostrom published: Are You Living In A Computer Simulation? He theorized that with a natural progression of technological advances, a large planet sized computational system could be constructed with the necessary processing power to simulate an entire cosmos. Given the evolution of information technology, then any sufficiently advanced civilization would attain the necessary level of molecular computing. Obviously, in order to have a simulated universe we need at least one naturally occurring universe. On the other hand, if the intelligence and technology in one universe evolves to the stage where they can simulate thousands or even billions of universes then the probability is much higher that we are living in a simulated universe. The psychedelic compound DMT presents several unique questions that are relevant to this discussion. First, it is significant to note that it is endogenous to many living organisms throughout the biosphere. It is produced in low concentrations by numerous plants and animals and notably, within the pineal gland of humans. Plants sacred to various cultures have very high concentrations of DMT and can be extracted and ingested. Its function is still largely unknown, though a recently published study showed that DMT increased the number and density of nerve cells as well as the number of synapses. The psychedelic effects produced by ingesting DMT result in a lot of unusual but strangely consistent experiences. These include: seeing intricate geometric structures and an expansive sense of space, conversations with friendly alien or divine beings, accelerating through tunnels at intense speeds, an experience of breaking through a significant boundary, being transported into alternate dimensions, visiting ultra-high resolution hyperdimensional worlds, palaces with many rooms, jeweled buildings, domed ceilings, flower patterned mandalas, as well as encounters with various colorful living beings and shapeshifting entities. 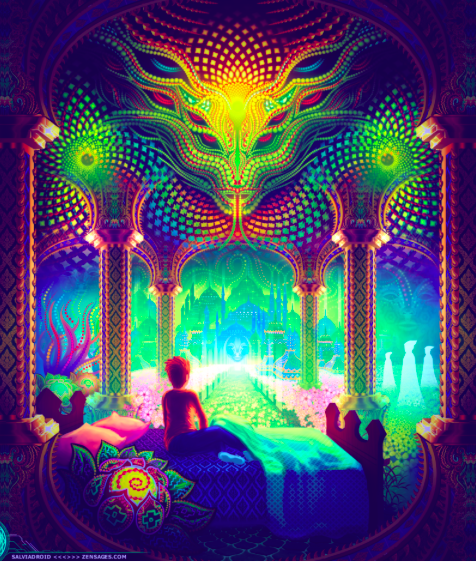 One of the more common explanations is that DMT is that it sends our minds into alternate dimensions where we have contact with hyper-dimensional extraterrestrial intelligences. Another explanation is that it transports souls into transcendental spiritual realms where they encounter disembodied spirits, angels, demons, gods and goddesses. In a neuro-biological model, the states of consciousness and their contents are hallucinations produced by neurochemical transmissions and cross-activated regions of the brain. The visions of alternate worlds and encounters with strange beings may be the result of the same mechanism in sleep paralysis where people are awake while dreaming and feel visited by a disturbing presence. Another alternative is to consider DMT experiences within the context of a Simulated Universe. In this approach, somehow the chemical acts as a kind of molecular code that allows people to exit our simulated universe. The parallels with the movie the Matrix are obvious but the domain of existence that people enter into are far more complex, beautiful and interesting than the gritty dystopian world in the movie. Dennis McKenna, an ethnopharmacologist and brother of Terence McKenna, who has experimented with and researched various psychedelic compounds, entertained the idea that the incredible widespread presence DMT in the natural world could be a genetically encoded message from an advanced alien civilization. Instead of extraterrestrial civilizations sending primitive radio signals, they could have transmitted information in genetic codes. And once a civilization had discovered the technology of molecular biology, they would discover the message. Given how much DMT permeates our biosphere and how it induces profound psychedelic experiences that resemble contact with ultra-intelligent extraterrestrial beings is certainly curious and may be the message. In the Star Trek: The Next Generation episode The Chase, a similar idea was presented. An ancient alien civilization had seeded the galaxy with DNA over 4 billion years ago. Different species on various planets scattered across the quadrant had similar protein structures that when combined created a genetic algorithm, a molecular computer program. When compiled it displayed a message from our common long-lost ancestor. When discussing DMT it would be difficult if not impossible to avoid mentioning the contributions of Terence McKenna, the bard of psychedelia. While some of his theories and conclusions were fanciful and unrealistic, he certainly provided some fascinating detailed observations about psychedelic experiences. Few of these standout as much as his DMT encounters with the so called Machine Elves; a kind of hyper dimensional, shapeshifting alien intelligence. What was very intriguing was his description of their means of communication through a self-transforming synesthetic language combining thought transmission along with various textures, substances and sounds. The amount of information they were trying to convey was always complex, confusing and overwhelming. Numerous others taking DMT have since described encounters with beings that are extraterrestrial or hyper-dimensional and whose communication was beyond human comprehension. What makes Terence’s detailed accounts so interesting are also the autonomy, complexity and otherworldliness of these beings. Maybe the beings encountered while on DMT are not extraterrestrial or spiritual but technologically advanced beings, not from the future or other planets but from outside our simulation. Or maybe they are advanced A.I. already living on a higher level of the simulation than we are immersed within. The author Daniel Pinchbeck described where he went on DMT as another dimensional reality inhabited by beings working at a higher speed and intelligence. And the mathematician Ralph Abrahams in the Spirit Molecule interviews described the DMT experience as an enhanced reality composed of fractal like vibratory fields, oscillating in bands of an energetic spectrum. Activities at different speeds appeared to be different intelligences conveying different categories of information. He could see coordinated activity in vastly different regions that seemed to be coordinated to such an extent that it appeared to be an intelligence of some form dispersed through space fractally. Is he describing a kind of information network, a hyper-advanced internet? Let's perform a short thought experiment to explore this theory. First, allow our current planetary internet to evolve to a fully fiber optic ground-based backbone connected to satellites and advanced microwave based wireless networks running at 6G or 7G speeds. Increase our data compression and intelligent transmission capabilities exponentially and connect every human, business and billions of smart objects on the planet. Then allow access through every mobile device, computer, gaming console, headset and haptic suit in the world. Spin information technology forward and allow for neural implants with direct access to augmented reality and full submersion VR. To complicate this further, lets add a school of dolphins, a herd of elephants and several species of simple and advanced A.I. as well as robots, Artificial General Intelligence and digital assistants to the mix. Now let's allow all of our current web-based interactions to have virtual interfaces… Facebook, Instagram, Amazon, Google, Netflix, Skype, Twitter, Spotify, your local food stores, restaurants, Uber and so on. Then, let's put a headset and haptic suit on a paleolithic human ancestor or give them neural lace or brain implants with free web access for fifteen minutes at a time. Maybe even give them access to stolen and cached credentials that allow unrestricted access to multiple accounts and domains. What would they be able to make sense of our online existence? What would they be able to report back to their kin sitting around the fire at night while eating grilled mammoth? Better yet, grant access to a chimpanzee or ancient primate ancestor. We like to think that we would be in a better position if we were cast into a technologically advanced world a hundred, a thousand or ten thousand years beyond our own. The truth is, we would be hard pressed to assess and describe even a fraction of what we experienced. And what we saw and heard may in fact be a lot like the encounters people have had on DMT. *It is all too easy to make DMT experiences sound wonderful and fantastic, but visiting to those places is not like putting on a VR headset and going to a pleasant upgrade of Second Life. Many of the seasoned explorers of consciousness with psychedelics recommend caution, especially when using the high dosages of DMT needed to break through into alternate realities. Patricio Dominguez, a shaman interviewed in the documentary: The Spirit Molecule, said that the set and setting for the DMT experience is one’s own psychology and that there can be lingering effects. Some of the trips can be confusing, terrifying, overwhelming and even bring the experience that one is dying. When we survey the experiences of these explorers, a fascinating picture builds in our imagination that meshes with Simulation Theory. Further research is certainly needed. Nick Bostrom - Are You Living In a Simulation? W. James Gates - Are We Living in an Ancestor Simulation?